The shell of this chair by Royal College of Art student Ryan Jongwoo Choi is created by moulding resin over a crumpled aluminium sheet. The seat and backrest of Ryan Jongwoo Choi's Crumpled Chair are formed by pouring a thin layer of resin over a faceted aluminium-foil framework covered with a plastic bag. "The shape is related to the phenomenon of gravity," said the designer. "My challenge was how to catch the moment of a natural phenomenon, and put it into the design." The quick-setting liquid resin fills the creases in the plastic and hardens into a "crumpled" form. Jongwoo Choi uses a resin that hardens in five minutes and only requires a thickness of five millimetres to support the weight of a person. "The form looks like crumpled paper which means it seems impossible to sit down in the chair, however, it's stable and has an aesthetic visual quality in terms of the design," Choi explained. The process is undertaken while the mould is positioned at various angles, to ensure that the resin fills all of the gaps. Changes in the angle of the mould also create differences in the chair's surface. "How much of the resin I pour in and how I set the angle as the resin is setting results in chairs with different volumes, heights and shapes," Choi told Dezeen. "A plastic bag has the specific features – it's an elastic and flexible material – to catch the detail shape with just small amount of the liquid." The four legs are made from 34-millimetre pinewood sticks, cut to length and slotted inside 36-millimetre acrylic tubing. When set into the resin, the white material seeps down the tubes to meet the staggered shapes cut from the tops of the supports and sets them in place as it hardens. 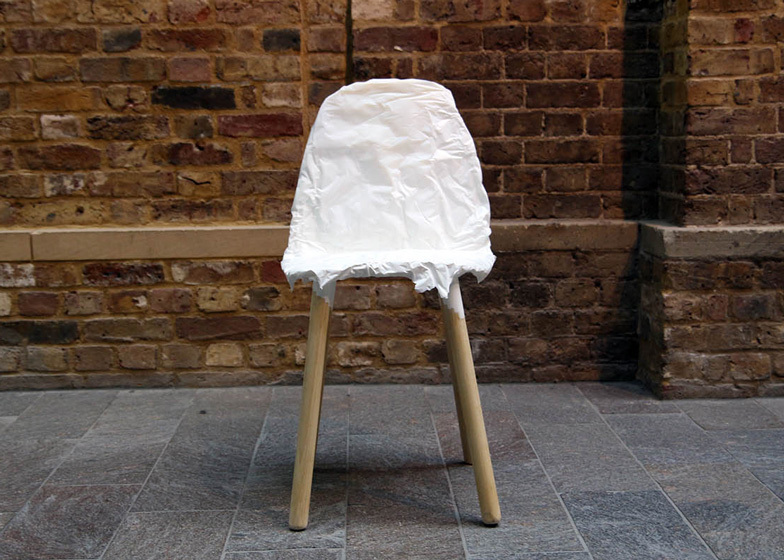 Crumpled Chair was exhibited at the Royal College of Art's Work in Progress 2015 show, which took place at the London institution's Kensington campus earlier this year.